One of the most common questions I hear when I speak about TBG’s bees is, “Do they swarm you?” Of course bees do swarm occasionally, though never at anyone (this is not a defensive behaviour, rather a sign of successful growth of a hive). Sure, swarms are not high on a beekeeper’s wish list because they divide the hive’s population, leaving the beekeeper with a smaller number of bees to bring in the honey flow. In fact, for a newbie beekeeper, letting your bees swarm would be the equivalent to a new gardener proudly showing off how well their new goutweed plant is coming along. A rookie move. I can say with pride that the TBG has never had a swarm in our bee yard for all our years of beekeeping… until last week. When we had several. Since we are a teaching facility, and we know that mistakes are opportunities to learn, I humbly share with you some of the lessons we learned about early summer swarms. Swarms are fascinating. Gathered around the queen at the centre, this calm bundle of bees is just hanging around for scout bees to return from casing the neighbourhood for a new home. Once a potential site is found, the swarm will fly off to take up residence. 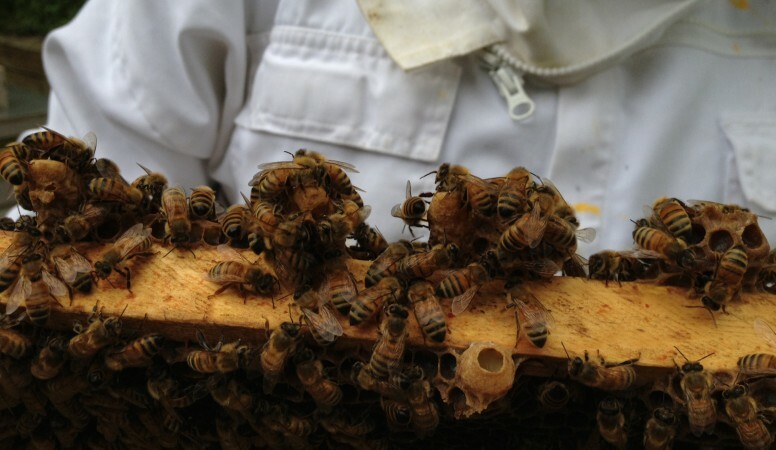 The sooner a beekeeper can catch and reinstall a swarm into a brood box, the better. Stalking a flying cloud of bees by car has its challenges. Swarms are deceptively mild, not wild. Many people would be alarmed at discovering a big ball of bees hanging out in a tree. In fact, bees are at their most docile when in a swarm. These homeless bees, bellies stuffed with honey (think overnight bag packed with provisions), are at their most vulnerable to weather and predators. Catching swarms isn’t a walk in the park. My first swarm took it easy on me by gathering on a low-hanging branch. The later swarms, well let’s just say that balancing a banker’s box threaded on a 12’ long-handled lopper perched on a 20’ ladder isn’t as easy as it looks. Getting ready to go talk the bees into a nice, comfy box. Swarms are a sign of healthy bees and a healthy hive. When a hive is filled to the brim with honey or brood and the queen no longer has a place to lay eggs, the hive will begin building swarm queen cells on the bottom of the frames. The old queen will leave the hive with a contingent of workers just days before the new queens emerge and duke it out for supremacy of the less congested hive. Swarm queen cells built along the bottom of a frame. A swarm is the mystery of the hive-mind working at its peak. From building swarm cells to the delicate dance of queens, to the process of finding a new home (or helpfully being coerced into a cozy wooden box), learning to read the bees as a group-mind is definitely both art and science. We’ve made it through all these swarmy days and with more than just new knowledge of how to better care for our bees–we also have a new hive! ‘June’ is the daughter-hive of Pollen Nation, our scrappy hive of summer swarmers.